I've been busily packing books away into boxes today - and there, between two of the books I was about to pack, I found buried treasure. 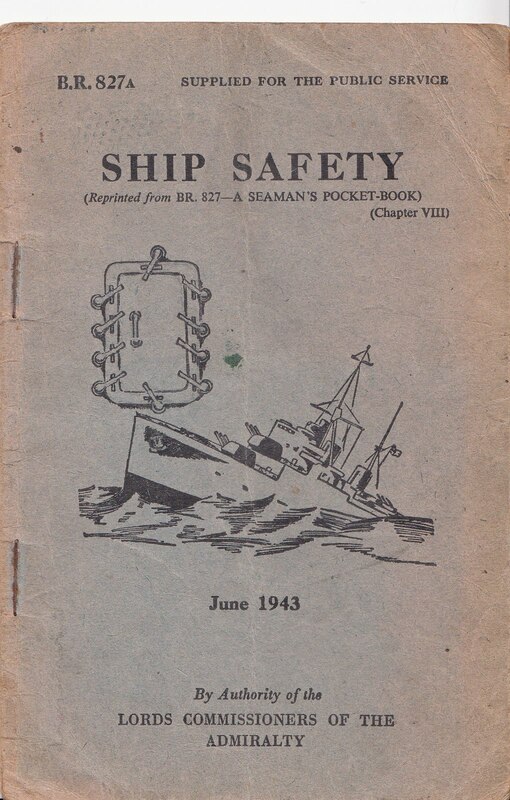 Somehow, my Dad's old Seaman's Pocket-Book had lodged itself between two hardback books of mine. 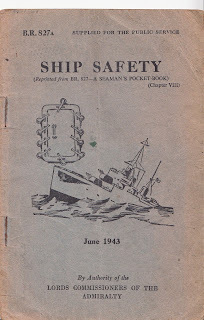 Printed in June 1943, it lists all the steps to take as a seaman to ensure safety on board ship. Its opening words: "When a boxer goes into the ring he aims to hit the other fellow as hard and as often as he can. In the same way every officer and man in the Navy must fight his fleet, his squadron, his ship or his gun so that it will inflict the maximum possible damage on the enemy, and continue to do so as long as one gun remains above water. "But a cool and skilful boxer remembers to guard the vital points of his body, knowing that he cannot survive many rounds by wild slogging alone. In the same way a fighting ship, which expects to suffer damage in the normal course of events at sea in wartime, has an organisation covering the broad aspects of self-defence in every portion of the ship. "This organisation is known as damage control." 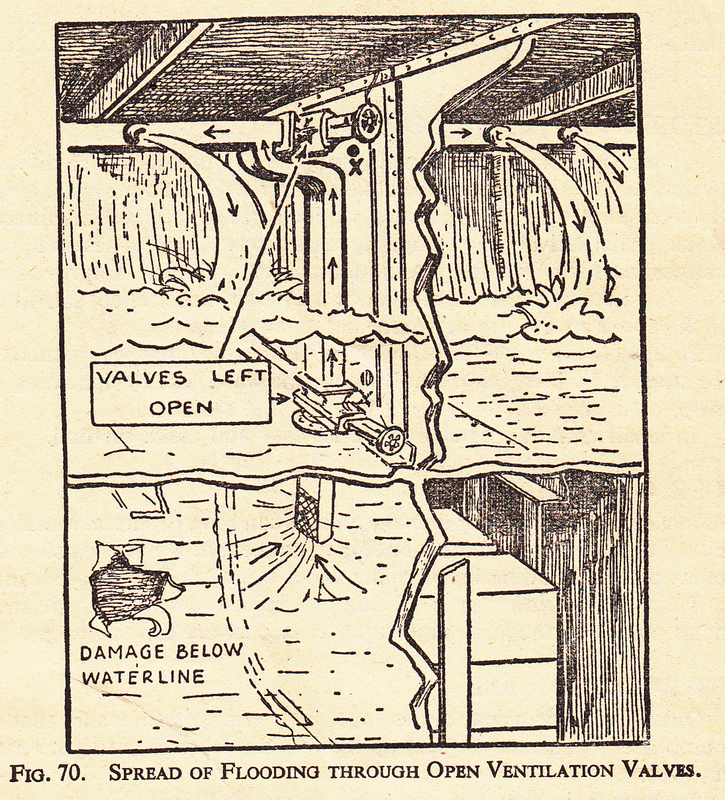 Some of the wording is on the frightening side, such as this: "The fighting efficiency of a ship may be reduced by casualties to as great a degree as by material damage. It is therefore your duty to the service, as well as yourself, not to become a casualty when care on your part might prevent it. 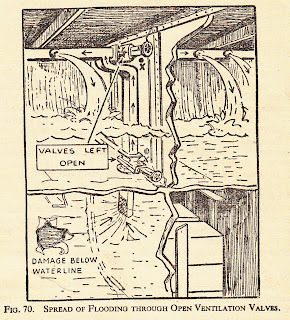 "When shells, bombs and torpedoes explode, there is a large, intensely hot, momentary flash. It persists long enough, though, to inflict ghastly burns on bare skin, but the flimsiest covering will provide sufficient protection during its very short duration. In battle it is not only asking for acute pain, but helping the enemy, to allow any part of your body except the nose, mouth and eyes to be exposed." The book's coming back your way, Dad. Or, as it says inside the front cover, G H Hunt S/M, 25 Mess, HMS Indom.